Gravel root is distinguishable by the purple band about 1 inch broad around the leaf point. The perennial plant reaches 5-6 feet, with pail purple to white tubular flowers, in a somewhat rounded cluster, blooms in August and September. The leaves, from 3-5 at the joint, are broad, rough and jagged. The root is the official part, with a fragrance resembling that of old hay, and slightly bitter, aromatic taste which is faintly astringent but not unpleasant. Found in low places, dry woods or meadows in northern, western and middle regions of North America and in Canada. Euparin, which is yellow, neutral and crystalline; eupurpurin is an oleoresin that is precipitated from an alcoholic tincture of the herb. The name “Queen of the meadow” is shared with a European species (Spiraea ulmaria). Spotted Joe-Pye weed (Eupatorium maculatum L.) is used similarly but the Native Americans used the root to induce sweating in typhus fever. Boneset (Eupatorium perfoliatum L.) is not the same as Joe-Pye weed, although they share the name boneset in some locations. 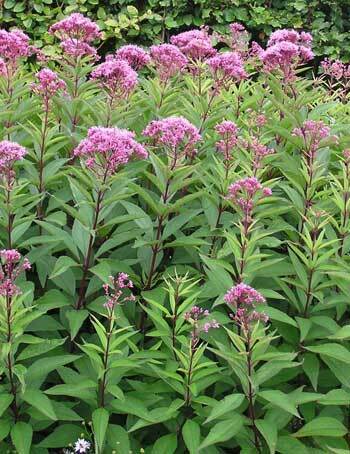 The Joe-Pye weed was named after a Native American doctor named Joe Pye who used it medicinally. The medicine man taught early settlers how to use it. A good remedy for gravel in the gallbladder, dissolves stones, chronic urinary and kidney disorders, bed wetting, poor appetite, dropsy, neuralgia, rheumatism. Very soothing and will relax the nerves. Increases the flow of urine. Combined with uva ursi, marshmallow, blue cohosh, and lily root, good for female troubles, bladder and kidney infections, diabetes, and Bright’s disease. Infusion or decoction: take 1 cup every 2 hours for excess uric acid. Tincture: take 5-15 drops in a cup of water. Cough syrup: made of the blossoms and leaves, steeped and boiled down, molasses added; then boiled to a syrup.